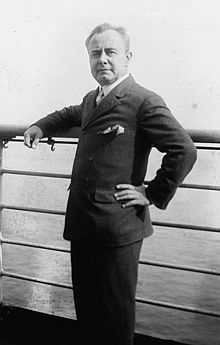 Josef Casimir Hofmann (originally Józef Kazimierz Hofmann; January 20, 1876 – February 16, 1957) was a Polish American pianist, composer, music teacher, and inventor. For the loudspeaker designer, see Josef Anton Hofmann. Josef Hofmann was born in Podgórze (a district of Kraków), in Austro-Hungarian Galicia (present-day Poland) in 1876. Hofmann was of partial Jewish ancestry. His father was the composer, conductor and pianist Kazimierz Hofmann, and his mother the singer Matylda Pindelska. 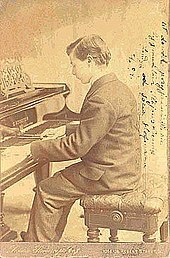 A child prodigy, he gave a debut recital in Warsaw at the age of 5, and a long series of concerts throughout Europe and Scandinavia, culminating in a series of concerts in America in 1887-88 that elicited comparisons with the young Mozart and the young Mendelssohn. Anton Rubinstein took Hofmann as his only private student in 1892 and arranged the debut of his pupil in Hamburg, Germany in 1894. Hofmann toured and performed extensively over the next 50 years as one of the most celebrated pianists of the era. In 1913, he was presented with a set of keys to the city of St. Petersburg, Russia. He moved to Los Angeles in 1939. Hofmann died of pneumonia on February 16, 1957 at a nursing home in Los Angeles, California. He had four children. His second wife, Betty Short, had previously been one of his pupils. Stojowski's Caprice Orientale (dedicated to him by Sigismond Stojowski). ^ a b "Josef Hofmann, Pianist, 81, Dies. Former Child Prodigy Was Noted as Interpreter. Corrected Conductor Acclaimed Here Final Appearance Here". New York Times. ^ Harold Schoenberg. The Greatest Pianist of His Time. New York Times, 18 April 1976. ^ a b "Nadia Reisenberg: Biography". Retrieved 19 July 2013. ^ Rachlin, Ezra. "Josef Hofmann — A Unique Interpreter". Archived from the original on 18 November 2013. Retrieved 19 July 2013. ^ Hofmann, Josef. "Patent 1614984" (PDF). Retrieved 19 July 2013. ^ Hofmann, Josef. "Patent 2263088" (PDF). Retrieved 19 July 2013. ^ Hofmann, Josef. "Josef Hofmann". Archived from the original on 8 July 2012. Retrieved 9 May 2010. ^ Henry Charles Lahee. Famous Pianists of Today and Yesterday. Boston L.C. Press, 1900 (re-print 1906). Book contributor: Music - University of Toronto. ^ Summers, Jonathan. "Josef Hofmann". Retrieved 26 July 2013. ^ a b Sergei Bertensson and Jay Leyda. Rachmaninoff: A Lifetime in Music. Indiana University Press, 2001. ^ Oscar Levant. The Unimportance of Being Oscar, Pocket Books 1969 (reprint of G.P. Putnam 1968), p. 124. ISBN 0-671-77104-3. ^ Hofmann, Josef (1920). Piano Playing with Questions Answered. Philadelphia: Theodor Presser. Retrieved 31 July 2009. ^ "Why was Josef Hofmann considered the greatest pianist of all?". The Daily Telegraph. London. 2009-09-17. Retrieved 2010-05-07. ^ Wakin, Daniel J. (2008-10-26). "Classical Ghosts, Audible Once Again". The New York Times. Retrieved 2010-05-07. ^ The Art of Piano: Great Pianists of the 20th Century. DVD released by Warner Music Vision, August 2002. Josef Hofmann | the pianist, composer, teacher and inventor A site In Memoriam of Josef Hofmann, comprehensive information on releases, compositions, inventions and discography.